Despite the fundamental differences between hockey and football, they have shared ideas for decades. At the 2014 World Cup, Holland coach Louis van Gaal had two men in his support staff who had never been associated with football. Instead, Hans Jorritsma and Max Reckers were professional hockey players. But in Brazil, they were strategic analysts for the Oranje. It was surprising. But hardly unusual. Holland’s favourite sport has often turned to its second-favourite sport for tactical inspiration. And vice versa. For years, the Dutch have followed a 1-3-3-3 system in hockey. It was their signature style but was eventually sorted out by their rivals. Now, they have introduced a new trend. Several football teams have recently turned to the idea of placing two controlling midfielders in front of a four-man defence. Arsenal, for instance, have stuck resolutely to the 4-2-3-1 formation in recent years. Looking at how the system provided flexibility for counterattacks while still providing defensive stability in football, Holland ditched their traditional formation and introduced the 4-2-3-1 system in world hockey. On the face of it, football and hockey have little in common. Both sports deploy 11 men on the field and the ultimate aim is to score a goal. But that’s where the similarities end. Or so it seems. Tactical crossover between the two ball games has existed for decades. Hockey often looked at football for its systems and counter-control techniques while footballers have often grudgingly admired hockey players’ speed, creativity and individual skills. Holland isn’t the only country where the two sports engage in exchange of ideas. Several coaches and players at the junior World Cup are open to the idea of looking at football to learn more about their own game. And Belgium are the latest addition to the list. The tiny European nation’s rise as a hockey power has intrigued even their football federation. “So, in the last 2-3 years, we have seen football coaches and analysts opening up to see what we have been doing in hockey,” Belgium under-21 coach Jeroen Baart says. Baart has been advising his players to observe the footballers. When they began their preparations for the junior World Cup, the half-Dutchman instructed his forwards to learn movements from their football counterparts. Baart wanted his strikers to look at how football players beat the offside trap and created space to receive the ball with their running techniques – forward or sideways. Like Thomas Mueller or Sergio Aguero. It’s something that fascinates even the Argentines. Their striker Nicolas Valeria, whose family lives in Barcelona, is captivated by Uruguay and Barca striker Luis Suarez’s ability to generate space inside a packed box. “That’s one aspect I look at. How he creates space, beats the defence and finishes ruthlessly,” Valeria says. Spain manager Alejandro Iglesias says one of the duties of their junior team midfielder Llorenc Grau Piera’s is to watch Barcelona playmaker Xavi Hernandez. “Great players always decide the next pass, someone like a Xavi. In the junior set-up, we’ve someone in that role (Llorenc Grau Piera), whose main job is similar. So we tell him to look at Xavi,” Iglesias says. Even India’s Sardar Singh has admitted to watching videos of Lionel Messi and Diego Maradona. “I have been watching them since a long time. I watch their videos and observe how they pass a ball, dodge other players, score etc. I watch it before a match, I have some of their videos on my iPad. It gives me confidence,” he had earlier said. For the hockey coaches, it’s all about studying structures. Soon after he guided Holland to a World Cup win in 1998, Roelant Oltmans joined football club NAC as their performance director. During his stint with NAC, which is now a second division side, the current India coach studied various patterns. 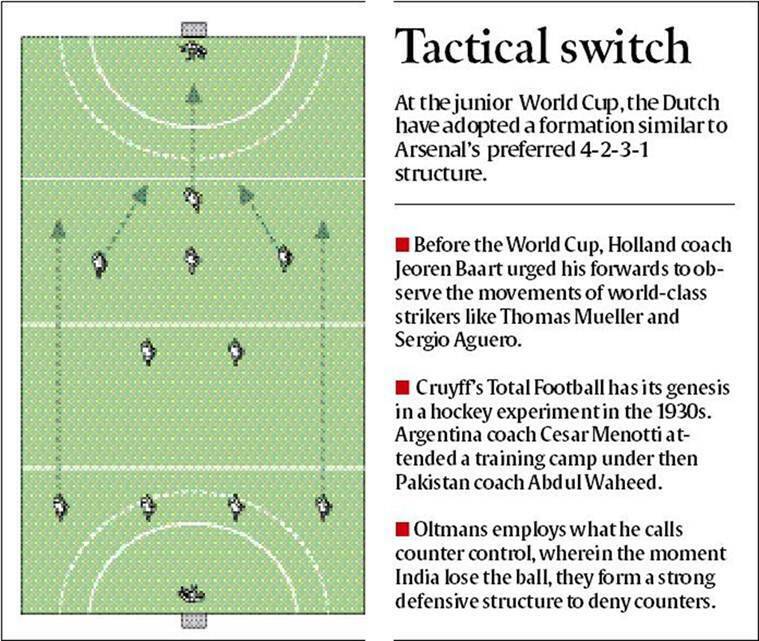 One of the biggest improvements India has made under Oltmans is with the defensive structure. The moment they lose the ball, Indian players are quick to form a strong defensive structure which prevents the opponents from launching a counter-attack. Oltmans, who likes the way Arsenal play (but is unhappy that they do not win), calls it counter control. Germany, of course, is a country where football has looked more at hockey for inspiration in recent years than the other way round. In 2006, the German football federation appointed a former national hockey coach, Bernhard Peters, as a technical consultant to overhaul the country’s youth set-up. Last year, they snapped another former German hockey coach, Marcus Weise, as the head of the federation’s academy in Frankfurt. Hockey’s most significant contribution to football, though, came in two separate incidents in 1970s. Argentina hosted both hockey and football World Cups in 1978. Back then, Pakistan were hockey’s wizards. Argentina coach Cesar Luis Menotti frequented the hockey ground and so mesmerized was he by the South Asian team’s virtuoso wing play that he attended a training camp under then Pakistan coach Abdul Waheed. Three months later, Argentina were crowned world champions. Even Johan Cruyff’s philosophy of Total football, which revolutionized the sport in the 70s, has its roots in a little-known hockey experiment in the 1930s. Both sports have evolved since then, but India has been living in a cave. There has virtually been no progression in the way both, football and hockey, teams have played while there is almost zero knowledge sharing. Oltmans remembers sharing notes with former India football coach Wim Koevermans during the 2014 Asian Games but there was very little practical application.